Threats come from a variety of sources. Insider threats, as well as malicious hackers, are not only difficult to detect and prevent, but many times the authors of these threats are using resources without anybody being aware that those threats are there. Threats would not be harmful if there were no vulnerabilities that could be exploited. With IT environments becoming more complex every day, the challenges to keep an eye on all potential weaknesses are skyrocketing. Smart methods to detect threats and vulnerabilities, as well as highly efficient approaches to analysis, mitigation, and remediation, become necessary to counter a growing number of attacks against networks, servers, and endpoints in every organization. 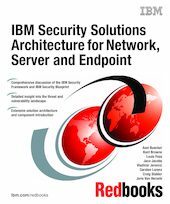 In this IBM® Redbooks® publication, we examine the aspects of the holistic Threat and Vulnerability Management component in the Network, Server and Endpoint domain of the IBM Security Framework. We explain the comprehensive solution approach, identify business drivers and issues, and derive corresponding functional and technical requirements, which enables us to choose and create matching security solutions. We discuss IBM Security Solutions for Network, Server and Endpoint to effectively counter threats and attacks using a range of protection technologies and service offerings. Using two customer scenarios, we apply the solution design approach and show how to address the customer requirements by identifying the corresponding IBM service and software products.